The Comprehensive Street Name Signs Quote Request can be used when the available online standard street name sign options do not meet your project needs. Custom Products offers street name signs, in many MUTCD compliant options, to fit the specific project needs of each road size and type. 2. Fill out the online form below and submit for quote. NOTE: A customer service agent will contact you with instructions to upload a logo, when applicable. Follow the 8 Steps below that include MUTCD guidance to help direct you in choosing the best signs for your application. Hit the Submit for Quote button upon completion. MUTCD guidance - For ground and overhead mounted signage, White reflective must be ≥120 candlepower. Green must be ≥7. and DG3 Diamond Grade Cube for Overhead Mounted Street Name Signs. MUTCD guidance - Acceptable alternative background colors to Green are Blue, Brown or White. Also acceptable are colors of sufficient contrast such as White on Black. The legend shall be White, except for Black on White signs. MUTCD guidance - Borders are optional, but if used, must be the same color as the letters. MUTCD guidance - Route symbols or Logos may be placed on the left side of a sign. The maximum height is the same as the letter height. MUTCD Guidance - Prefix/Suffix Height may be smaller than the height of the primary copy and may be abbreviated. No punctuation is to be used. Enter the Street Names needed, along with the quantity of each sign in the appropriate boxes for your road type below, as shown in this example. MUTCD Guidance - Initial upper-case letters at least 4" high and lower-case letters 3/4 height of upper-case. 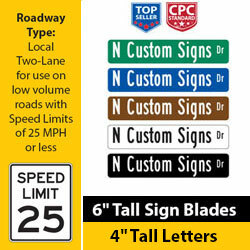 Blade Height: 6" | Corner Radius .75"
Letter Height: 4" | Prefix/Suffix Half Size Height: 2"
Blade Height: 8" | Corner Radius .75"
MUTCD Guidance - Initial upper-case letters at least 6" high and lower-case letters 3/4 height of upper-case. 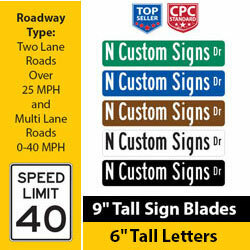 Blade Height: 9" | Corner Radius .75"
Letter Height: 6" | Prefix/Suffix Half Size Height: 3"
Blade Height: 12" | Corner Radius 1.5"
MUTCD Guidance - Initial upper-case letters at least 8" high and lower-case letters 3/4 height of upper-case. Letter Height: 8" | Prefix/Suffix Half Size Height: 4"
MUTCD Guidance - Initial upper-case letters at least 12" high and lower-case letters 3/4 height of upper-case. Blade Height: 18" | Corner Radius 1.5"
Letter Height: 8" | Prefix/Suffix Full Size Height: 8"
Blade Height: 24" | Corner Radius 1.5"
Letter Height: 12" | Prefix/Suffix Full Size Height: 12"
Letter Height: 12" | Prefix/Suffix Height: 6"
State Alabama Alaska Arizona Arkansas California Colorado Connecticut Delaware District of Columbia Florida Georgia Hawaii Idaho Illinois Indiana Iowa Kansas Kentucky Louisiana Maine Maryland Massachusetts Michigan Minnesota	Mississippi Missouri Montana North Carolina North Dakota Nebraska Nevada New Hampshire New Jersey New Mexico New York	Ohio Oklahoma Oregon Pennsylvania Rhode Island South Carlina South Dakota Tennessee Texas Utah Vermont Virginia Washington West Virgina Wisconsin Wyoming Please select an item. E-Mail *Required.Enter a valid format. Are You a Returning Customer? Yes No Please select an item.